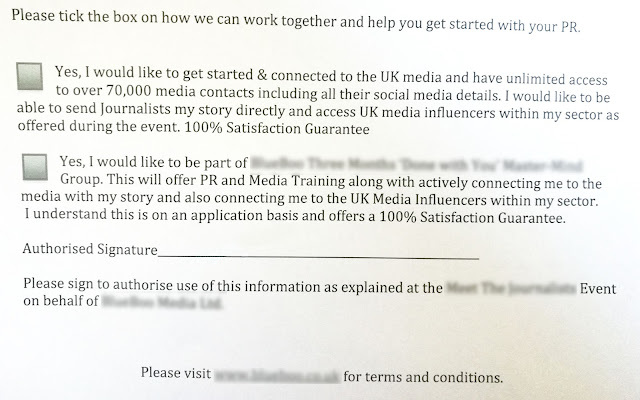 A small PR 'agency' offers a service to small businesses - access to journalists and support in getting your story out there. Their proposition is that you actually do all of the work yourself, therefore it's a fraction of the price of a full PR service. They organise a networking event, 'meet the journalists', in partnership with the business and marketing school of a local university. Instant credibility. They offer a line-up of 7 local journalists, good names. More credibility. "Have you ever wondered how to get your story out to a wider audience through the media? Join us at “Meet the Journalist” and ask the panel directly. Over 80% of those who pitched their story at the last event secured publicity on TV, Radio and in Press." Sounds great! The cost? £49. Minus a £30 discount for booking through the university. That's the first alarm bell - discounted pricing is a trick that we know that retailers use. At the very last payment stage, VAT gets added, another 20%. Ah well, I've filled out all my details now. As an aside, the invoice that they sent has no VAT number on it, so the chances are they're not actually VAT registered, and this is a sneaky way to increase your income by 20% on every invoice. An email confirmation arrives containing a terrific offer. A 14 day free trial. "As a thank you for purchasing your ticket we would love to offer you the chance to access Daily FREE PR Leads for the next 14 days. If you haven't access this already please click here to add your details. (name) secured a three page spread from replying to one of our PR leads in a (Magazine) plus he has secured coverage with the (media) reaching over 500 thousand unique users a day. Watch (name's) interview here and find out the exact simple steps he took to secure national publicity." Great! Except where it says "click here", there's no link. Ah, a simple error, a mistake. It's interesting that the link to watch the testimonial works, though. So in fact, there's no way to access the 'free trial'. I emailed the owner about this, no reply. At the event itself, the 'owner' of the PR 'agency' (actually self employed, it's just her), talks about how important PR is for businesses. Everyone nods. She talks about how difficult it is to reach journalists. Everyone nods some more. And we'd all love to get our story in the media, wouldn't we? Everyone nods feverishly. So far, it's following the pattern of a timeshare pitch. Only special people are allowed in, and a slowly building series of questions that demand a 'yes' answer lead us towards an inevitable outcome. Getting people to make written commitments is the next stage of the timeshare sale. It's also how American soldiers were persuaded to embrace communism during the Korean war. After everyone has handed their forms back in, the owner reveals the prices of these services. Eye watering, considering that we have to do all the work ourselves, the basic premise of her proposition. In fact, what she's actually doing is reselling someone else's PR marketing database. The evening ends, we go home. Outside of the room, people are talking to each other about how conned they feel, paying to listen to a sales pitch. The next day, an email arrives, containing this little teaser, "I will also be in touch with you again personally within the next 24 hours if you ticked the box to work together for either the xxxx Group or Media Database or both. I will be processing everything through and will send you further details." Processing everything through? What could that mean? Two days later, another email arrives. "Congratulations on joining xxxxx Media Database & xxxxxx and Coaching Programme"
Joining? I didn't join anything. This is a 12 month membership offering you full access to all UK media outlets, Journalists and Media Influencers. Membership is £220 plus per month paid monthly in advance. Your first payment have been allocated for March to your account and payments thereafter will be taken on the 10th of each month. Full terms and conditions are outlined on our website"
Payment? Allocated? I emailed straight back. "I've made no such commitment. A mistake surely?" Not surprisingly, I received no reply. Then I noticed that £858 had been removed from my bank account using the details that I gave when I bought my £19+VAT ticket. I emailed again to say that I had not authorised this payment and I'd like an immediate refund. "You signed up to the services for xxxxx at the event and as confirmed on the evening and with the emails following we would process your order through"
No, no, no. "I will be processing everything through" does not mean "I will be taking £858 from your bank account without authorisation". Telling someone that you told them something is not the same as actually telling them. Hoping that they won't remember that you didn't tell them is not the same as being honest. I explained this, and the next reply clarified my mistake. "The boxes explains that it's to sign up to the services and I explained verbally and in the email that the order would be processed and then during the skype call if either party no longer feels its right and that we will cancel the order and refund payment. I can see the emails have reached you and have your signed order here"
I pointed out that, since she knows her emails reached me, she must have seen my emails saying that I did not agree to joining her service. I also pointed out that the pricing was revealed after the forms were collected, and therefore her 'paperwork' does not constitute an order or a contract. "thats not correct, the price was offered prior to collecting the forms as I would not want to waste anyones time if the price was point was not suitable"
Really? Why would I tick a box for more information after discovering the ludicrous pricing of the service? Why, upon hearing the pricing, would I have thought to myself, "I wouldn't have ticked the box if I'd known that." More to the point, if there is a "100% satisfaction guarantee" then why argue? Why prove that you're right and your prospective client is wrong? I've been to timeshare presentations. It's really a beautiful process, built upon the principles that Robert Cialdini explains so neatly in 'Influence: Science and Practice', along with the fact that human beings have terrible memories. This is really a great business model. From now on, when a prospective client enquires about my services, I'll ask for their bank details "for security verification and anti fraud reasons", then I'll take a year's worth of money from them as a "convenience charge" and then argue with them when they ask for it back. Brilliant. The lesson? If you treat everyone as if they're stupid, you'll probably get lucky enough, often enough to make a living. Peter Freeth is an author, consultant and trainer who seems to spend an inordinate amount of time chasing other people to simply do what's right and what they promised. Sometimes it's a futile battle but at least he still has his dignity.